Melisa from Melisa's Crafty Creations here with you this morning. I'm in charge of planning the Teacher Appreciation Week activities at my son's school. And I have been busy trying to get everything ready for next week. Well one of my friends has been helping me out a lot and I thought I would make her a Thank you card. Since the wobble was wider than the sushi rolls I just trimmed it a little so it would fit. 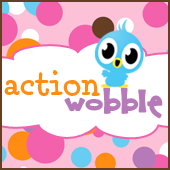 You can buy the Action Wobbles HERE.